When most Americans think of macaroons, they think of those lovely lumpy chewy coconut balls. However, a French Macaroon or “le macaron” in French, is a delicate airy meringue sandwhich of fanciful colors and filled with either a flavored buttercream, jam, or ganache. 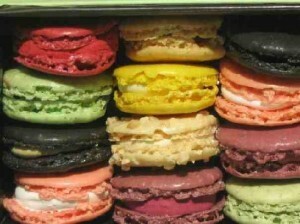 So what is the origin of the French Macaroon or Macaron (pronounced mah-kah-RONE). France? Well, not so fast. The English word macaroon is derived from the French macaron, which in turn comes from the Italian word for paste, maccarone (mah-kah-ROW-nay). Some culinary historians claim that this delicate cookie originated in a Italian Monastery. Catherine de Medici, wife of King Henri II. Two Benedictine nuns, Sister Marguerite and Sister Marie-Elisabeth, seeking asylum in the town of Nancy during the French Revolution (1789-1799), paid for their housing by baking and selling the macaroon cookies, and thus became known as the “Macaroon Sisters”. The macarons they made were a simple combination of ground almonds, egg whites, and sugar. No special flavors. No filling. Just 100% cookie. It wasn’t until the 1900s that Pierre Desfontaines of Parisian pastry shop and café Ladurée decided to take two cookies and fill them with ganache. 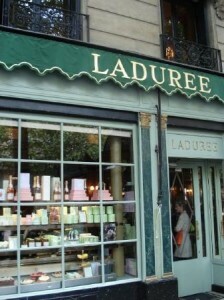 Today Ladurée continues to be one of the first stops for macaron-crazed fans in Paris. No longer a humble almond cookie, the macaron turned into a versatilely flavored treat with a thin, light crust briefly giving way to a layer of moist almond meringue following by a center of silky smooth filling. *Petit-four is French for “small baked pastries.” There are two styles of petit-fours, glacé and sec. Petit-fours glacées include filled and/or iced petit fours, miniature babas, miniature éclairs, tiny iced cakes and tartlets. Petit-fours secs include small cookies, macaroons, meringues palmiers and tuiles. The words mignardises (min-yar-DEEZ), from the French for “preciousness,” and friandises (free-yon-DEEZ), from the French for “delicate,” are often used instead of petit-fours.